TIAS.com, one of the longest-running online marketplaces, came in eighth overall in this year's EcommerceBytes Seller's Choice Awards, up from twelfth place last year. Its overall ranking rose from 4.8 to 6.3. Sellers referenced a new upgrade last year that has helped boost exposure of their listings, as well as responsive and helpful support, but some sellers reported a problem of low sales. TIAS.com earned its highest marks in customer service (6.9), bucking the trend that sees most marketplaces earning their highest marks in ease of use, where TIAS earned 6.4. The antiques site earned its lowest marks in profitability (5.5). Have sold on TIAS for 14 years. Have seen other sites come and go, TIAS is still here. Service is good, very easy to use. Offers a lot of bells and whistles for dealers. Been with them for many years - always helpful. Easy to use, human responses and not press buttons, good distribution. I have already recommended this site to many people. They keep their sellers constantly updated as to what is going on, they check your google ratings constantly and go out of their way to assist you with sales. They are wonderful! Tias is a superior company on all fronts. As a smaller website, they surprise. Easiest to use, they allow us to use our OWN SKU (Inventory #) to identify our items. They retain old listings for our re-use if we want. They send out Merchant Newsletters to keep us up to date about Google requirements, system upgrades, and ways to advertise. They make lots of effort to advertise for us too. They have the most buyer payment options for us to offer (PayPal, Google, Mastercard, Visa, AmEx, Discover, Money Orders, Personal Checks) and really went to bat for us when PCI requirements went into effect for Merchant Accounts. They really try hard to help us sell. TIAS has been around for 16 years. In 2011 the site began an upgrade in appearance and software resulting in an increase in traffic and sales. TIAS is also one of the few ecommerce sites that lists a toll free number to reach customer support. Easiest site to use. They are not constantly changing the site or rules that make selling more difficult. Support can not be matched. I recommend them at all shows, auctions and anywhere else we may go. The customer service for sellers is outstanding. The policies and rules are minimal. Sellers are given the freedom to run their own business without interference or complications. Great site to be a seller. I am constantly recommending this sales venue to dealers in the physical antique and collectibles mall where I also sell. I think a few might have actually signed up here or with other similar sites. I have been a happy camper here for quite a long time. I also have my own direct site, but I like the way I can keep up with my inventory and all. I'd rate this site as A, not perfect, but I give it a very high grade. The quality of dealers is also very high and honest. Seller fees are reasonable. The only hic-cup site has when downloading listings, it is rather slower than other sites. Great site since it supplies helpful programs for seller to use, past orders, etc. I love the site and their pricing, but they have been dropping in dealers and its reflected in sales. My sales have all but stopped since the changes in Google. There is no one that comes close to their good customer service. They are great. Excellent site, specializing in antiques and collectibles. I wish they did more advertising. Overall, this is a site people go to for antiques, customers pay better prices for items. Very good site but not too many sales! I no longer sell at Tias because sales dropped dramatically when the economy went south. You still must pay the monthly fee, of course, even if your sales are minimal. 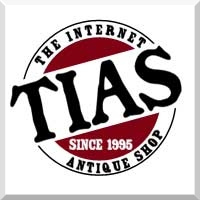 Tias has a great set of seller tools and several years ago I would have highly-recommended this venue as a profitable place to sell vintage items. Unfortunately, my slower sales here, less traffic, and the cumbersome checkout process for buyers are all reasons I would be less likely to recommend Tias to friends or colleagues now. Management does not communicate planned site changes or improvements to sellers, they do not listen to their sellers concerns or comments about site changes. Ongoing issues that have been reported by members are often dismissed as unable to duplicate the error. Several links within the site on both store pages and other resources are dead links and do not work. Has the potential to be an very profitable site and in the past has been very profitable but due to the above issues. Selling costs and Fees are too high. TIAS.com has really gone downhill, no longer caring about their sellers and it shows in sales. If sellers aren't happy, buyers will not be there. The site runs slow, the cart is difficult for buyers to use, and Support DOES NOT respond in a timely fashion to critical problems/questions. Very disappointing as this business has the potential to be great. Too costly and filled with a lot of junk. Hard to sell nice items.